CM Magazine: Steampunk! : An Anthology of Fantastically Rich and Strange Stories. Steampunk! : An Anthology of Fantastically Rich and Strange Stories. Kelly Link & Gavin J. Grant, eds. Somerville, MA: Candlewick Press (Distributed in Canada by Random House of Canada), 2011. Sometimes out in the garden, she sees smoke in the distance and hears zeppelins overhead. She finds other unusual things, marks of the war in the sky. Once she found a metal leg, torn off, lying among the carrots and vegetable marrows. She told the garden robot to get rid of it, and it dragged it away to the compost heap, leaving a trail of dark oil behind. Sometimes the finds dropped pamphlets, showing pictures of starving children or great metal hand crushing innocent families, but the words are in a language she doesn't understand. Steampunk! is a beautiful anthology from the cover to the layout, composed of stories from 14 talented authors. 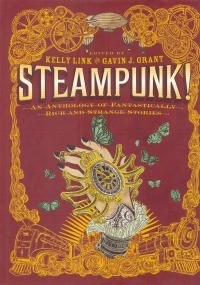 Each story takes a unique position on steampunk themes, mixing and matching components of imagined futures and histories with steam and clockwork technology. Some stories are re-visionings of established stories while others are entirely original, blending steampunk visuals with very ordinary realities or pushing the boundaries of steampunk altogether, bringing flying machines into Roman conquests or clockwork toys into worlds inhabited by fairy folk. The collection opens with Cassandra Clare's "Some Fortunate Future Day," a story following a young girl who finds a pilot, shot down, in her garden during World War II. She lives in a house inhabited by automatons and dolls that speak and think on their own. She also knows of a machine that will allow her to turn back time. When she finds herself in a confusing and frustrating situation, she has to decide whether or not to go back a few days to try again. Following this is Libba Bray's "The Last Ride of the Glory Girls," which imagines a wild-west type of literary world populated by religious fanatics and an all-girl team of bandits. The girls have the ability to stop trains in their tracks long enough to steal gold, money, and jewelry from rich passengers. Bray's style of writing is fun and adventurous, mixing well with the fictional environment that her characters inhabit. Other stories include Cory Doctorow's "Clockwork Fagin," a Dickensian tale of disfigured orphans living together in a mismanaged orphanage run by some not-too-bright nuns. When a new boy comes to the orphanage and takes care of the problem, the orphans have to team up to overcome new challenges and convince the nuns that they don't need a new dictator to run the place. "Hand in Glove" is another re-imagining of a well-established story by Ysabeau S. Wilce. The story tells a version of Frankenstein in which a killer is terrorizing the local population, but only one detective manages to track down the devious murderer with the help of a strange doctor who can bring dead things back to life. Not all of the stories in the collection are as invested in the steampunk world, however. As the back of the anthology says, Steampunk! is an anthology that "defies even as it defines the genre." Kelly Link's "The Summer People," for instance, contains very little of what many would consider essentials of steampunk, namely clockwork creatures, flying machines, and strange versions of modern technology re-imagined with much more fanciful visuals. Link's story borders on fantasy, with fairy folk and magic being much more prominent than anything related to clockwork machinery or steam-powered automatons. Some might see this story as unrelated to the steampunk genre, as I did, but as with any anthology, the stories are always a somewhat mixed bag. The same goes for Shawn Cheng's "Seven Days Beset by Demons." One of my particular favourites was Dylan Horrocks' "Steam Girl." The story follows the burgeoning relationship between a young boy and his new friend, a girl who is constantly at the brunt end of bullying for wearing an aviator hat to school. She is imaginative and troubled, and these qualities shine through in the stories that she tells the narrator about her adventures on distant planets, dealing with strange characters and using strange and sometimes silly machines. What I particularly enjoyed in this story were the layers of fantasy and reality running through the core. Steam Girl is a troubled soul with a distressing family situation that she can only handle through telling her stories. When she brings her Reality Gun to school to destroy the troublesome world around her, I can't help but feel my heart break for her. Overall, each story is fanciful and inventive, fun and imaginative, exciting and unique. Fans of steampunk in any form will find something to suit them within these pages, whether it be in the wild-west with an all-girl band of outlaws or in an alternate version of ancient Rome in which oracles reside in the cogs of machines and battles are fought with airships and steam-powered tanks. Whether or not a reader likes every story or only a select few, the worlds created in each tale are strong and vivid, the authors utilizing an intriguing mixture of genres, blending steampunk in ways not previously attempted. It should be noted that there is some coarse language and a few instances of drug and alcohol use, as well as some instances of abuse throughout the collection. But even so, this anthology is a must-read for anyone who enjoys alternate worlds, crazy machinery, past and future re-imaginings of established stories, and tales that speak to our current treatment of the world and our own technology. Rob Bittner is a graduate of the MA in Children's Literature program at The University of British Columbia in Vancouver, BC. Every time he reads Steampunk, his world becomes a little bit brighter.